New Definition: With the new NCD, SGDs are allowed to have both our research-backed language system and advanced technology options like email and instant messaging. Lingraphica has added in many new features to our SGDs to accommodate the expanded definition of a "speech-generating device." Keep it Regardless of Living Situation: Under the "Capped Rental" policy, CMS would end payment on the rental speech device if a patient entered a skilled nursing facility or hospice. The Steve Gleason Act reversed this policy and mandated that CMS move SGDs into the "Frequented Purchased" category. Now, device users own their device and can keep it with them regardless of their living situation. Coverage of Eye-tracking Technology: The Steve Gleason Action means CMS must provide coverage for eye-tracking technology on SGDs. This technology is important for patients who rely on the use of their eyes to navigate a device. 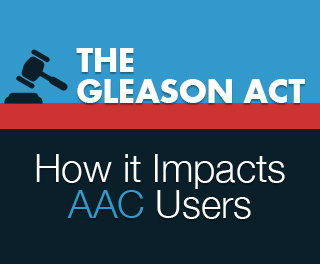 The passage of The Steve Gleason Act and the finalization of the NCD is a monumental step for Medicare beneficiaries who rely on SGDs to communicate. The reform represents the hard work of many industry partners including SLPs, clinicians, device manufactures, and patients. Lingraphica is pleased to see congressional support for the protection of this advanced technology. and ask for our reimbursement department.